Below are things to watch for to avoid Internet Scams! Online auction fraud accounts for three-quarters of all complaints registered with the FBIs internet division, and the methods for the fraud change as quickly as they are discovered. Use good sense: It almost goes without saying, but anytime you’re dealing with strangers, be smart and use common sense. The internet allows for many wonderful things, but also hides the identities and actions of less scrupulous people. If something seems too good to be true, it probably is. Also, start small, buying or selling small items, to get accustomed to how online auctions work. Check out multiple auction sites: Most sites work in a similar fashion, but have different rules and policies regarding fraud, returns, insurance, etc. Really shop around before selecting a site that you feel most comfortable with. Pay special attention to the sites rules on insuring its users against fraud. Compare prices: One way to avoid getting ripped off is to shop around to get a feeling for how much something should cost. If someone is offering something at half the price anyone else sells it for, beware. While online auctions can in theory allow for lower prices, the savings shouldn’t be dramatically higher than other online sources. Also, many auctioneers rely on the misconception that online auctions are always cheaper to sell people products at an unfairly high price. Like a going out of business sale, the conception that you are getting a huge discount is actually false a significant amount of the time, so be sure to compare prices to see if you’re getting the best deal. Review seller feedback: As a way to self-police, most online auction sites allow for buyers to give feedback on a seller. While this is useful and you should definitely read the feedback, take it with a grain of salt. It is very easy for a seller to get friends or acquaintances to give positive feedback, and it’s even easier for a thief to set up multiple identities and give him or herself positive feedback. Though if a person has blatantly negative feedback or the feedback seems unnaturally consistent (as if written by the same person), be skeptical and look elsewhere. Insist on safe payment methods: One of the most popular online scams is to use certain payment methods, such as wire-transfer services (e.g., Western Union, MoneyGram), to make the payment. Once you wire the money, it’s gone, so never deal with someone who wants you to wire money. Also beware of cash only requests or when a seller wants you to send to a P.O. Box. It’s always the best idea to use a credit card, because credit cards provide tracking information, typically have some sort of fraud protection built in and have a process for disputing charges. Another common alternative is PayPal. Insist on safe shipping methods and insurance: Use established shipping methods that require a signature, are traceable and allow for shipping insurance. If you use methods that can’t be traced, the other side can simply claim they never received it. Also, look for items that are insured either by the seller or by reputable providers such as PayPal. Use escrow services for high value items: For high value items, consider using an escrow service. Be very careful when selecting an escrow service however, because one of the most popular online scams is to use fake escrow services. Really do your research before choosing an escrow service, and make sure that it is well known and has a good reputation. Escrows serve as middlemen who hold onto the payment until the buyer receives and approves of the item before releasing the payment to the seller. Keep records: This almost goes without saying, but keep all of your records. Not just receipts, but emails, confirmations, packing slips, etc. Many people also take pictures of items they receive as proof of the condition it arrived in. Beware of inflated bids or shills: Less scrupulous sellers may have a friend or accomplice place a bid to inflate the bidding price or start a bidding war. If you examine the sellers history and see the same person constantly bidding up their items, be very careful and consider looking elsewhere. Report fraud: Finally, if you are a victim of fraud, report it. Thieves rely on apathy and embarrassment to keep their victims quiet. There are several places to report online auction fraud including the site itself, the FBIs online division, the Federal Trade Commission’s website (www.consumer.gov) and the National Fraud Information Center (www.fraud.org). 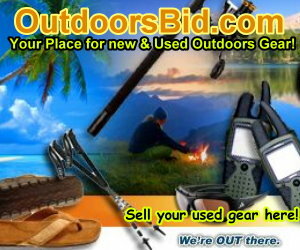 There are plenty of deals to be had online, and participating in auctions can be exciting and fun. Just don’t check your common sense at the door when you login, and be careful. This information can also be found at http://consumer.findlaw.com/online-scams/protect-yourself-from-online-auction-fraud.html I thought it was important to provide good information on how our users can best protect them self and this article seemed to be a very good source of that information! Geocaching; Go on a Treasure Hunt in Your Area!